So here's where we went Saturday in Kaiserslautern in search of Rauchbier. First stop, Toom Getränkemarkte, Mainzerstraße 113, Kaiserslautern. Lots of great beers, no Rauchbier. 2nd stop, Fristo Getränkemarkte, Mainzerstraße 63. No luck. Inside Fristo. Tidy and clean. Wouldn't you like a beer selection like this? 3rd stop, a little mom and pop place, Getränkemarkt Schäfer, Friedenstraße 3. Speaking of mom and pop, Otto's & Rosi's Imbiss Ecke (Corner). We passed this little Imbiss and since it was just after noon we stopped. Had a couple bratwursts, pommes frites and little Bitburgers. Perfect! 4th stop, Schreiners Durstlöscher Getränkemarkt, Mennonitenstraße 11. Success!! Well, almost. Brauerei Spezial Rauchbier Lager. It is from Bamberg and it is a Rauchbier. It's not Aecht Schlenkerla Rauchbier even though that's what the sign says that Jeff's pointing at. Also, this is a Lager, Schlenkerla is a Marzen; subtle difference. So, for today we figured, close enough, and they told us that they do normally carry Schlenkerla. So we bought the eight remaining Spezial Rauchbiers and plan to return. Why? Because it's there. No Jeff, you can't have that. Well, this is what we brought home. Yummy!! So the quest continues. We've still got a list of at least eight more places to check, but that's for another day. PROST!! The wine fests have begun!!!! As a US service member in Europe, one of the big events each spring is the Stars & Stripes publication of the calendar of all the wine fests in Germany from April through October. Well, that was last Thursday and, with that, Jeff and I figured we’d better get right on it and not fall behind in wine fest participation. Not that we did last year but it’s best to start early and finish strong. So last Saturday we drove to Freinsheim for one of the first wine fests of 2012. Freinsheim is about a half hour east of Kaiserslautern and the Ramstein Air Base area. It’s an easy drive on the A-6 autobahn with an exit onto the famous Deutsche Weinstraße, German Wine Road. Freinsheim, although not right on the Wine Road, it’s a couple miles east, is just a short drive south from the A-6. This puts Freinsheim right in the middle of Germany’s largest wine growing region, part of the Rhineland-Pflaz. Freinsheim’s wine fest was a particularly fun event because of the way they presented their wines to the festival goers like Jeff and I. For 10 Euros each we got a yellow wrist band that allowed us to visit 10 different vintners in the town. At each vintner we had the opportunity for unlimited sampling of the wines they had on display; lots of whites, Rieslings, Silvaners, Rivaners, Gewürztraminers and more, and reds like Portugieser, Dornfelder and Spätburgunder. And, like I mentioned, unlimited sampling. You could stand all day at one vintner if you chose to but Jeff and I were determined to visit all ten. Here’s our Saturday adventure. The Freinsheim wine fest is called the Blütenfest (Blooms Fest). Vintner #1 is Weinparadies Freinsheim. Here we’re inside. Just bought our wrist band and ready to get to work. Here’s the wine list that we could sample at Weinparadies, from dry to half-dry to sweet. Vintner #2, Weingut Altes Landhaus (Old Country House). Only about 8 wines to sample here but still tasty, fun and the people were so nice. Vintner #3, Alte Bäckerei (Old Backery). When we got to their sampling area we learned that they were not providing samples of wine but vinegar. Yes, vinegar!! Skip #3. Although Germany is not known for its reds, we had a really good red Dornfelder here. These vintners were just great and answered all our questions about their vineyards and wine production operations. Jeff and I at the Freinsheim wine fest. Jeff wearing a beer hat (Pilsner Urquell) to a wine fest. The man has no couth. Sights of Freinsheim. Freinsheim has a really pretty old town area and they do a number of different festivals here at different times of the year. I’m assuming that’s the Freinsheim coat of arms which is about the gate on the town wall. You can see the white and blue diamond pattern that’s typical of Bavaria. Freinsheim, is now part of the Rhineland-Pfalz but prior to WW II the town was part of Bavaria. Vintner #5, Winzerhof Rehg. Not sure who this wine nymph is supposed to be. Good wines here too. Duh!! Narrow alleyway between #5 and #6. Quite a selection of wines to sample here, probably twelve reds and twenty whites. Vintner #7, Weingut Kreuzhof, Family Herbel. Now, as I mentioned, as long as you wanted to sample their wines, these vintners would keep pouring, so size of the sample wasn’t much of a concern but at #7, the samples were certainly generous. In Germany, if you’re going to have a festival of any kind you have to have as a minimum one carnival ride for the kids and one candy vendor. Here they are. Vintner #8, Weingut Primann. Let’s see, which one first? It’s very common at these festivals for the wives to bake up a desert of some sort and bring them in to raise money for some cause or charity. These look very inviting!! At Krebs, blooming trees at the Blütenfest. The wine sample table in Krebs was placed in front of these new wine barrels, a great setting for sampling wine. Vintner #10, Weingut Weisbrod. Big time head fake from these folks Their sampling area was not at their hotel like the map showed and since we had to go well out of our way to get to the hotel we didn’t feel like wandering around looking for it. So headed back to the car and that was the end of our day in Freinsheim. So, one down, who knows how many to go. But, if Freinsheim was indicative, 2012 is going to be a good year for wine fests. A very good year. Our first stop on Day 2 in Istanbul was at the Hippodrome of Constantinople. During the Byzantine Empire (395-1204) the Hippodrome was a place for horse and chariot racing, gladiator contests against man and beast, and even day long circumcision ceremonies (you'd certainly want a front row seat for that). The first hippodrome was built on this site in 203 AD but when Constantine moved the Roman Empire capital here in 324 AD it was greatly expanded so that it could hold 100,000 spectators. Today this area is a large plaza with three ancient structures still in their original positions. Here, the closest object in this picture, is the Walled Obelisk which was built in the 10th century. Originally it was covered with bronze plates but they were pilfered during the Fourth Crusade and now only the stone core remains. Maybe a 100 meters beyond the Walled Obelisk is the Serpent Column and about the same distance again to the Obelisk of Thutmose III. The Serpent Column was originally in the Temple of Apollo at Delphi in Greece. Constantine had it moved to the Hippodrome. All that remains now is the spiral column but originally, at its top, was golden bowl placed on the heads of three serpents. The Obelisk of Thutmose III was brought to the Hippodrome in 390 AD from Luxor, Egypt where it had existed since 1490 BC. Emperor Theodosius had the original olelisk cut into three pieces. What can be seen today is only the top section that was placed here in 390. Although this obelisk has existed for 3500 years it is in amazing condition. On the day we were at the Hippodrome there was a Istanbul Tulip Festival. The tulip is an important symbol of the city. Images of tulips are all over the city, from the designs of ancient porcelain tiles to the place we were staying, the Hotel Tulip Pera. Although Holland is world renowned for its tulips, the very first tulip bulbs brought there came from Turkey. You can see the two tulip designs either side of the musicians. This design is very common all over Istanbul. So, here’s a little video celebrating the Tulip Festival. Just across the street from the Hippodrome is the Sultan Ahmed Mosque, better known as the Blue Mosque because of the predominant blue tiles inside. The Blue Mosque was built over seven years from 1609 to 1616. Muslims must wash their face, hands, and feet before entering a mosque to pray. This is the washing area at the Blue Mosque. Closer image of the washing area at the Blue Mosque. Folks washing up before prayer. Woman are not allowed to wash in the open area where the men wash. They wash in a private area out of the view of others. Two of the minarets of the Blue Mosque. You can see that one has two balconies and the other three. Before electronic speaker systems these balconies are where the call to prayer would be performed. The Blue Mosque actually has six minarets. The more minarets a mosque has to the more prestige it holds. During the Blue Mosqu construction only one mosque in the world had six mosques and that was in Mecca. When it was discovered that the Blue Mosque would also have six, the mosque in Mecca built a seventh minaret and now is the only mosque in the world with that number. In Istanbul, by counting the total number of balconies on the minarets of an imperial mosque you can tell the dynasty of that Sultan of the Ottoman Empire. The Blue Mosque has 16 minaret balconies so Sultan Ahmed I was the 16th ruler of the Ottoman Empire. Prayer area of the Blue Mosque. Close up of the carpet that covers the floor in the prayer area. The darker red lines are the position where the men stand prior to leaning down to pray. Shoes are not worn within a mosque. We removed our shoes and carried them in a provided plastic bag in all the mosques we visited in Istanbul. Images of the Blue Mosque. Video inside the Blue Mosque. The gate to the Dolmabahçe Palace. In 1843 the sixteen year old Sultan, Abdülmecid I, ordered the construction of a new residence for himself and future Sultans. 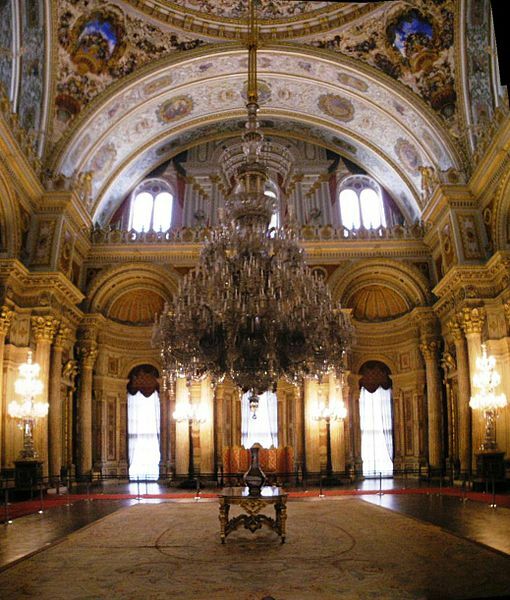 Dolmabahçe became the first palace in Turkey to be built with a European design. Upon its completion in 1856 it became the home of the Sultans of the Ottoman Empire until 1923. The interior is beautifully magnificent. 14 tons of gold leaf covers the ceiling of the palace. No photographs are allowed during the tour so I got the following images off the web just so you could see some of the things we saw. This is the Crystal Staircase. In addition to the huge chandelier you can see the crystal balusters used to support the stairs bannister. 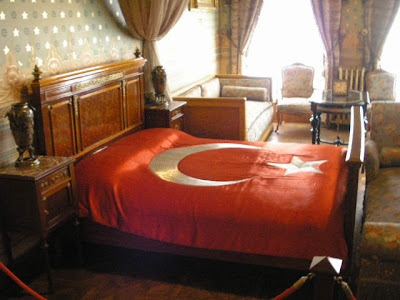 Mustafa Kemal Atatürk, father and president of the Turkish Republic, used Dolmabahçe Palace for administrative and formal functions when in Istanbul. At the age of 57, after an extended illness, he died in this bed in 1938. The attending physician pricked Atatürk’s finger after his death to put a few drops of blood onto the bed sheets. Those sheets remain on the bed tody. 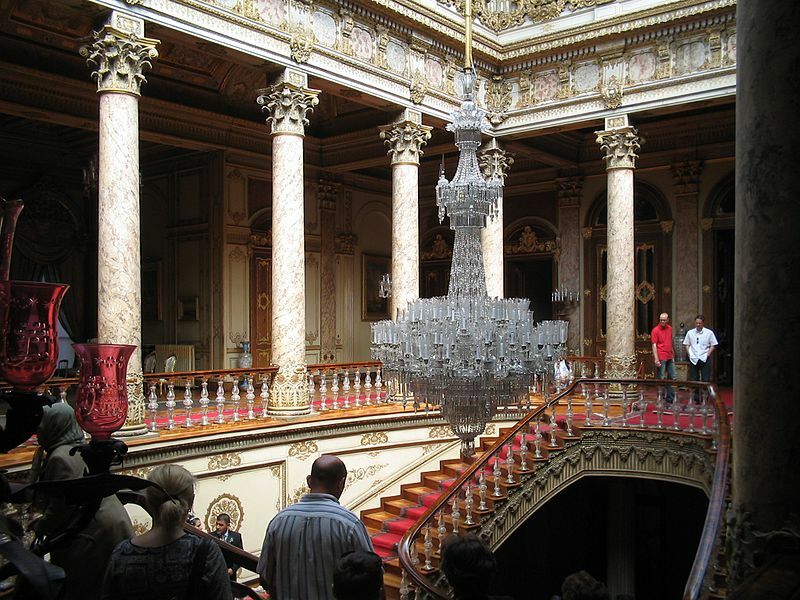 This chandelier in Ceremonial Hall, a gift from Queen Victoria, weighs 4.5 tons and has 750 electric lights. Dolmabahçe Palace sits on the western shore of the Bosphorus Strait. Anyone arriving at the palace by boat would have passed through this gate. Across the Bosphorus from Dolmabahçe Palace you can see the Asian side of Istanbul. Süleymaniye Mosque was built under the order of Sultan Süleyman between 1550 and 1558. Süleyman the Magnificent was the Sultan of the Ottoman Empire at the peak of its size and power, actually laying siege to Vienna, Austria twice before being turned back. Mimar Sinan, the famous Turkish architect, who designed many of the major mosques in Istanbul, designed the Süleymaniye Mosque. By the way, since this is an imperial mosque and you can count 10 balconies on the four minarets, this indicates that Süleyman the Magnificent was the 10th Sultan of the Ottoman Empire. Inside the Süleymaniye Mosque you can see the red areas to stand or kneel in the prayer area. Images of the Süleymaniye Mosque. The mosque was recently renovated so the colors of the building are very bright and the walls in excellent condition. Video in the Süleymaniye Mosque. Outside the Süleymaniye Mosque is this area where worshippers can wash prior to entering the mosque to pray. This structure is a row of shops and cafes owned by the Süleymaniye Mosque. These establishments pay to operate here earning the mosque funds for various activities and charities. This is where we stopped for lunch and because it’s a mosque owned building we figured no beer for lunch. Oh contraire! Here’s part of our meal, an excellent fava bean soup with rice and these goofy glasses are our beers. The waiter sort of clandestinely told us we could get wine or beer. I assume by using these glasses that it didn’t make it too obvious that we were drinking beer at the very gate of the mosque. After we had lunch we were taken to a jewelry store although no one in our group was really interested. We spent the time there on their roof taking in the sun, watching the traffic on the Bosphorus Strait and drinking some çay tea. So here I am with my çay. You’ve got to put in at least one cube of sugar because it’s pretty strong. In the background one of the 3000 mosques in Istanbul. From the top of our jewelry store perch here's a view to the north across an inlet of the Bosphorus Strait known as the Golden Horn. That section of Istanbul, across the inlet, is also known as the Golden Horn. To the left is the Galata Bridge. Now we're at the Spice Bazaar, also known as the Egypt Bazaar. The bazaar buildings are part of the Yeni Camii Mosque, also known as the New Mosque, which you can see here. Vendors rent goes to the Mosque for upkeep and other monetary needs. The Spice Bazaar is across this plaza and is the long red brick building in the foreground. On the same plaza, looking back to the west, high above you can see the Süleymaniye Mosqueand on the high terrain and the Rüstem Pasha Mosque on the right. The Spice Bazaar is the second largest bazaar in Istanbul after the Grand Bazaar. It's also called the Egypt Bazaar because funds from Egypt were used to build it. This plaque shows the dates of construction of the Yeni Camii Mosque, 67 years. Interesting since imperial mosques took a much shorter time to build, Süleymaniye Mosque 8 years and the Blue Mosque 7 years. Images of the Spice Bazaar. Our group rented a boat for a Bosphorus tour. We're just about to get started. Here's Jeff and I with the Yeni Mosque and the Spice Bazaar in the background. From our boat on the Bosphorus is the Topkapi Palace. Dolmabahçe Palace. From this view you can really see the European influence in the design. Istanbul is the only city in the world that sits in two contintents, Europe on the western side of the Bosphorus Strait and Asia on the eastern side. The Bosphorus Bridge completed in 1973 was the first highway connection of the two sides of Istanbul. Rumelihisarı is a fortress that was built on the European side of the Bosphorus by Mehmed II, the Ottoman Sultan. The fortress was built from 1451-1452. He built this as a point to further his conquests because in 1453 he moved south from here to conquer Constantinople which began the Ottoman Empire. This was the Sultan's hunting lodge on the Asian side of the Bosphorus. Sultan's never stayed here other than to arrive, change into their hunting clothes, change back into their Sultan finery and then sail back down the Bosphorus. Kuleli Military High School is on the Asian side of the Bosphorus. It was started by the Ottoman Sultan in 1845 and is still a military high school today. Our boat docked on the Asian side of the Bosphorus so that we could say we were in Asian. So, here I am in Asia. That's our boat behind me. Our group of 15 had it all to our selves. We're about to leave the Asian side of Istanbul. We're about to pass under the Bosphorus Bridge again. This is looking west toward the European side of Istanbul. Our boat tour is almost over and so is Day 2 of our tour of Istanbul. We really lucked out on the weather. Both days of our tour were in the mid-60's and partly sunny. After we had our evening meal on our last night in Isatnbul and we were back to our hotel the skies opened up with lightening, thunder and hail. Next morning on our way to the airport it was foggy, drizzly and low 40's. Our trip to Isanbul was wonderful, educational and quite memoriable.